This breathtaking array of fall colors and textures is enough to take anyones breath away. Makes a great Thanksgiving centerpiece or decoration. 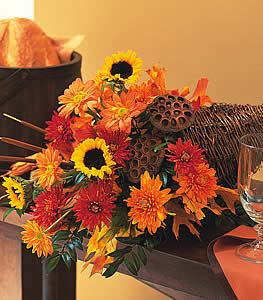 Chrysanthemums and sunflowers with cattails and lotus pods arrive in a wicker cornucopia.